J Francis - Platinum Overlay Sterling Silver (Pear) Necklace (Size 20) Made with SWAROVSKI ZIRCONIA , Silver wt 9.30 Gms. A diamond in the platinum setting is something that every lady wishes for, but as simple as it may sound it is not an inexpensive pleasure of life. For such expensive aspirations, TJC has brought for the women of UK an incredible alternative in the form of an exclusive in-house brand J Francis. Leaving you wanting for more and more, the J Francis brand is all about making luxury accessible without a hefty price tag. Elegantly crafted in Sterling silver with a lavish and sleek overlay of 950 Platinum or 14K Gold, each piece of the J Francis collection exudes luxury and an evergreen appeal. Featuring the best and the most beautiful of Swarovski Zirconia crystals, piece from the J Francis collection look equally dressy for special occasions as well as casual appearances that require slightly special touch-up. The exceptional designs and fine craftsmanship of our artists make this collection a must-have for every gorgeous lady in the UK. Ranging from on-trend cocktail rings to designs that will make prom outfits pop, we have a piece to suit individual style and budget preferences. The collection is rich in trendy and chic bracelets, rings and necklaces that will instantly enhance your overall ensemble and look. 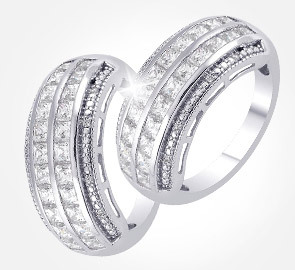 Instantly add sparkle to your outfits with the glitz and glamour of Swarovski Zirconia complemented with the resplendence of 950 Platinum overlay at the most incredible prices possible. Mix and match exquisite pieces to make a wedding jewellery set that will make you look like a ‘diva’ on your big day or pick as a delightful gift for a loved one. At TJC, we constantly endeavour to make sure our valued patrons get not only quality but on-trend look through our creations at affordable prices and we have tried to enliven the same with the brand J Francis. Achieve a luxe look for less than ever, always with J Francis.